I hope the start of your work week is going well. 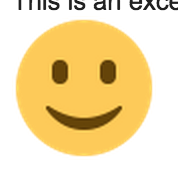 If you’re having a case of the Mondays, take a look at the giant smile I accidentally included in this past weekend’s email. Having as many backup sources for revenue as you can manage. As a bonus benefit you’ll see your overall revenue numbers go up. Why? For the first time in your freelance career your revenue will not be tied to your time. Need to go on vacation? That support contract check is still going to come in while you’re away. I signed a $42,000 support contract based on your suggestions last week. I knew I needed to do it, and we closed before I left on a week-long trip. Support Contracts generate you recurring revenue just like the seven other recipes in my book, the 7 Recurring Revenue Recipes for Freelancers. Like the recipe for your favorite meal, they will give you step by step instructions to give it a try. Let’s get started with learning how to write a support contract. Writing a support contract is no different than writing a proposal. It needs to cover the work you will be doing plus the constraints involved in the project. In every one of my support contracts I have a section entitled “The Things We Will Do for You”. It covers in specific detail the kind of support that will be offered. Phone or email-based user-level support. Time spent by Retainer to resolve the issue, except in the case of defect. It should be emphasized that an annual service contract is not designed to replace an on-site system administrator, but rather to provide a secondary support role in cases when the local system administrator is unable to perform certain tasks. You’ll notice how specific the language is. It covers the support being provided and the limit of the support (80 hours). In some cases you have to protect yourself by also specifying things not included in the service. Information support: It is expected that the users of the Application and all third-party components contained therein understand the intent, results and data associated with the Application. Retainer will provide assistance in understanding and using the Application for its designed use cases. Retainer will not, under any circumstances, provide training on or assistance with third-party components contained within the Application. On-site support: This support agreement does not include assistance provided by Retainer personnel at the purchaser’s site. If desired, the purchaser may contact Retainer to negotiate the terms of such support. Further development: This support contract does not entitle the purchaser to any custom or continued development. Feature requests may be submitted to Retainer for consideration for inclusion in future releases of the Application; however, Retainer holds no obligations to act upon such submission. It may seem like overkill to define everything but doing so allows you to remain on the same page as your client. It leaves little room for assumption. And it’s perfectly ok to provide support outside the realm of this agreement. Describe what’s expected from the support client. How long before you expect them to respond? When is it ok to call? hint, hint. Not in the middle of the night! Pricing breakdown. How much do each of the different support services cost? For fixed bid projects I’ve been able to charge around 10% of the total cost of the project. Contract terms. When does the support end? When does it start? Is it annual, quarterly, or monthly? Renewal terms. When is renewal due? What happens if they do not renew on time? Finally you need to have all this looked over by your lawyer. They’ll make sure you do not state anything too ambiguous that will come back to bit you later on. Do you have support contracts of your own? Was there anything I missed? If so, send a comment below.